Talking about Incarnational ministry seems to be all the rage at the moment, but, I have to confess, the way it’s talked about makes me rather uncomfortable. Now, I’m sure many people express it very carefully; yet the reality is, those aren’t the people I hear expressing it. And when I hear it expressed it’s not fourteenth or fifteenth hand, mangled in transition like an extreme version of Chinese whispers. No; when I come across it it’s normally in books (which, one would assume, have not only been carefully written, but carefully edited as well). So, it is the concept of incarnational ministry I have qualms about, not just some poor distortion of it. What? How could I have qualms about something so cutting-edge in evangelical ministry? 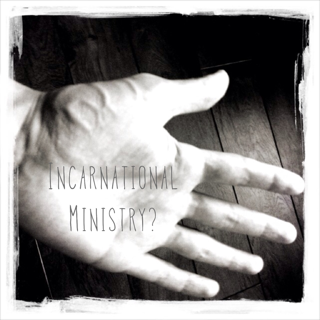 Simply because I fear that ‘incarnational ministry’ undermines the reality of the Incarnation. Recently I read a description of incarnational ministry which rested on God being ‘the incarnational God’. It went on: ‘So incarnational is He, that He’s not content to have a relationship outside of you, but has come to indwell you and incarnate Himself within your daily lives.’ Can you see the problem there? It makes incarnation all about God coming to indwell us by His Spirit, and if you apply that to Jesus, you get much less than the God-Man! In fact, what you get isn’t an incarnation at all! The Incarnation means that the Word became flesh – the eternal Son of God took to Himself true (and full) humanity. That’s very different from the Holy Spirit indwelling someone’s humanity. When the Holy Spirit indwells me, I’m still me. When the Word became flesh, that human being was (and is, and will always continue to be) the Word. The Son didn’t come and indwell a person – His humanity is His very own humanity. (To get very theological on this point, His humanity is anhypostatic – it doesn’t exist as a person apart from its union with the Word – and yet enhypostatic – united to the Word it has real personal existence in the one person of Christ.) If we start teaching people about something ‘incarnational’ in terms of the indwelling of the Holy Spirit, it seems inevitable that it will pull down the glory of Christ’s Incarnation in their minds until it becomes no true incarnation at all. Now, I’m not suggesting that those who write about incarnational ministry follow through with such a readjustment of the Incarnation. Mercifully we don’t always follow the logical implications of our own teaching the full way. But what I am saying is that when you start redefining an important word like Incarnation (which, to be honest, we evangelicals aren’t all that good at talking about in the first place, so there are probably many people in our churches who aren’t well grounded in that particular doctrine in the first place), people are very likely to end up confused about the proper meaning of the Word (i.e. Christ’s incarnation). And then it’s no wonder we end up hearing such statements as ‘Jesus doesn’t have hands and feet now – we’re His hands and feet!’ I’ve heard that (or a variation thereupon) many times now, both from pulpits and pews – and, while it catches the jist of ‘incarnational ministry’, it denies the reality of Christ’s incarnation! Just to be clear, Jesus does have hands and feet now! Remember those angels at the Ascension who said that He’d come back the same way He went; He went with hands and feet and He’ll come back with hands and feet. The Incarnation wasn’t a temporary clothing with dispensable humanity. To sum up the Incarnation in the words of the Shorter Catechism, ‘the eternal Son of God, became man, and so was, and continueth to be, God and man in two distinct natures, and one person, forever’ (WSC, Q.21). The Incarnation means that Christ has united Himself to our humanity forever! There’s a big difference between an ‘incarnational God’ who indwells people and God Incarnate who came into this world to live, suffer, die and rise for us and our salvation. In fact, it’s only because of God Incarnate that we can know the indwelling of the Holy Spirit in the first place, for Acts 2 makes it very clear that it’s the one who was crucified, buried, rose and ascended who poured out the Holy Spirit on His waiting disciples. So that’s why I’m not at all keen on all this talk about incarnational ministry, as it can so very easily undermine Christ’s incarnation in people’s minds. If we really want to talk about ‘incarnation’, why don’t we preach and teach Christ’s incarnation? After all, the Incarnation’s not just for Christmas, it’s for life! Bible Reading: Duty or Joy? "You and me bleed exactly the same"